Today, it seems that everyone knows about cloning, but few are actually aware of what it actually does to today’s societies. Before the thought of having a doppelganger of you was thought up, the world had little worries about such things, and even when the first scientists hypothesized the possibility, it was still written off as another mad scientist scheme. It was not really until the media and entertainment industries got their hands on it and began envisioning all the horrors it would entail, such as clone armies, literal identity theft, and fodder for all sorts of insane, mad-scientist experiments. Protesters and critics are not the only ones following this course of action. Various political groups have enacted legislation banning or severely limiting the processes that are used for cloning, the largest most likely being the Bush administration that banned federal stem cell research and with it effectively halting all federal cloning research. Other countries have followed suit some way or another, as of now 50 countries have legislated bans on cloning and the United Stations have considered a global ban altogether. Perhaps the biggest impact, far more reaching than the previously mentioned, has to the entire entertainment and news industries. Hollywood is always on the lookout for a new concept to beat into the ground and make a profit with various movies on the subject, and news agencies are constantly searching for the next “great fear” that will catapult their station to worldwide fame. 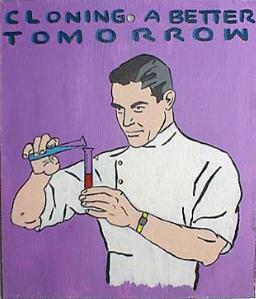 As such, the whole world suddenly seems to know everything about cloning, (which generally constitutes what news agencies have reported as the truth and how believable/plausible movies have made them out to be) and with it, public opinion quickly degraded to their polar opposites: complete opposition or total support. Many of the ethical issues surrounding cloning are the direct cause for the sudden shift in society’s attitude towards cloning. 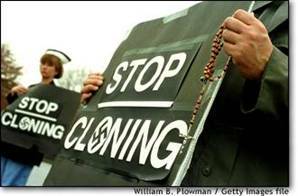 Before cloning became mainstream, there were no major protests arranged by religious groups condemning it, no politicians deploring the process, and no talk shows delivering their opinions to the daytime masses. Now that it becomes more and more of a reality these days, all of these things have become commonplace and now do not even make headline news as they used to when they first started picking up. What is even more disturbing is how some have even gone as far as ostracizing the individuals involved for things they have not even achieved, because they believe that no matter the outcome it will be a travesty to the public. 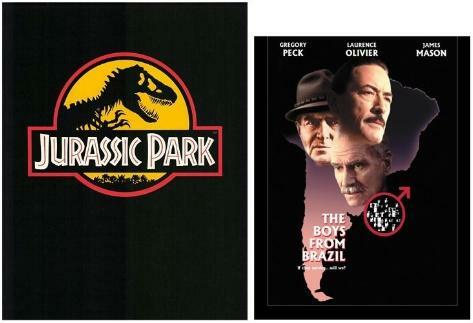 Movies like the ones shown above helped bring the subject of cloning more into the mainstream, courtesy of Hollywood. Unfortunately, the way it is protrayed is generally not accurate or even plausible, a fact that most viewers do not fully realize.